Apple May Launch A New iPhone for Verizon. And it may not. Rumors and statements abound about Apple making an iPhone compatible with Verizon’s CDMA standard. If it happens the announcement will be in early summer and production will begin in September. BUT, if the information is correct, ATT will have a carrier competitor losing their exclusive reseller status. The instrument part is easy to figure out, but what of the App Store? Now that’s something to cogitate upon. Verizon Wireless has 89 million customers with an annual revenue of $58.6 billion. Notably Verizon operates the largest wireless 3G network and voice carrier in the nation and is the largest wireless carrier in the U.S. AT&T has nearly 70 million mobile subscribers. Two gorillas going for one banana. Who is downloading GPS Tracking Apps? Canada likes their GPS Tracking Apps. Falling behind the strong UK for only 1 week, Canada shows that they can overtake the UK again this week racking up more downloads. Canada makes a decisive push to overtake the United Kingdom in this week’s “iPhone GPS Apps download statistics by a country” contest. While Canada had a temendous amount of downloads this week, it was France holding strong with the most downloads of any other country. Here at LOCiMOBILE, we hold a friendly competition to see which country will download the most iPhone and Android GPS Apps each week. Singapore continues to push hard, but it wasn’t enough to overtake Canada this week. UK falls a spot to third just ahead of Singapore, and Australia trails (among the top five.) Will anyone catch the French? Check back next week! “i” am here there and everywhere or is that Google “i” see. As the dominant mobile platform, Apple’s current SDK may be retarding the expansion and adoption of social location apps. 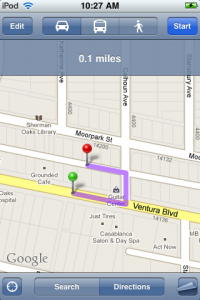 Apple’s single greatest drawback for social location apps is single-tasking (i.e. no background processes). The LOCiMOBILE suite of apps does not share this problem as it runs-peer-to-peer. If the push for better and more useful location apps continues, developers will be faced with a very hard decision – to stay with Apple in the hope that they can gain more users and switch them over to better features if/when Apple finally decides to allow background processes, or opt to stay on the bleeding edge and build innovative features/apps on other platforms such as Android as LOCiMOBILE has done. The independent App Store business is on fire. Pocketgear acquires Handango becoming number 3 behind Android and Apple. Sprint has just announced a major deal with mobile application store GetJar, an independent mobile phone application store. With more than 60,000 mobile apps and 750,000 downloads for the Android, Symbian and Windows Mobile platforms, GetJar commissioned a market research study that predicts explosive growth of the mobile app market. Findings project mobile app downloads increasing from 7 billion in 2009 to nearly 50 billion in 2012 valuing the market at 17.5 billion dollars. However the study suggests a drop in the average price of an app to 1.5 dollars in two years. A reality call for developers… get downloaded or die a pauper. Research indicates that people are less concerned about their location being tracked if they find the service useful. While GPS technology is a one size fits all solution, each marketed application offers a unique bundle of services. The choice of application comes down to one’s personality; are you a social or a private person – the difference defines the degree of privacy needed to share personal information with others or not. Position-aware services – when a mobile phone reacts to its own location like auto time zone change – were also perceived by researchers as less intrusive than the location-tracking applications like “friend finder” – a service based on one’s tracking another’s location – supporting the notion that people are more concerned for their privacy when others can track their location. To soften the line between the two formats many developers have engaged in place-based locates linked to public establishments as meeting places to diffuse the privacy issue and underwrite the app with ad revenues. Other developers such as GTX Corp have elected to pin point the location of a subscriber’s GPS enabled phone, but only if the person being asked for their location gives their permission. The location is not published on the web, but only shared peer to peer between the app subscribers…with a text message and directions on how to rendezvous. Necessity may well be the mother of invention and app pie alternatives. With so many hungry for a slice of the ever growing app pie, even a small slice can get quite expensive. For developers with egos to match their appetites, but only loose change to get a seat at the table other menus need to be cooked up. Bango surveyed more than 400 app developers and content providers in the United States and Europe, and the results revealed that nearly half of developers plan to monetize their applications outside iTunes, Android Market and AppWorld. With mobile Web browser and GPS capabilities continuing to improve, many are starting to see the benefits of browser-based distribution over which they have fiscal and marketing control. Will the consumer go elsewhere to satisfy their lust for the latest and greatest….we think that marketing with incentives will have a voice and the ear of the marketplace…but not today. Facebook will be offering geo-location features enabling subscribers to append proximity information to their status updates. Opt in choices will permit location information to be shared with the social networking platform. Google will face a challenge from Facebook in the local small business advertising niche as many users will find themselves meeting up for fast food, beverages, shopping and entertainment venues. Twitter is in the same ‘geo-location-space’ and will also challenge the AdMob’s, Google and the iPhone for growing location aware advertising dollars. Tech-savvy travelers with smartphones are transforming the travel business. It would be hard to find someone that remains untouched by the effects of the mobile Internet. In fact, the communications industry has been hard at work getting everyone to lead untethered lives which is especially attractive to early adopting road warriors. Beyond online maps and travel guides, travelers are turning to their phones to look up aircraft seat configuration, track taxis, reply to early hotel check-in requests, order room service and locate nearby colleagues… a LOCiMOBILE specialty both here and abroad. Entrepreneurial software developers are rolling out new services daily, such as “location-based” apps that tap into a phone’s GPS to determine the user’s location presenting unique options and opportunities. The apps are making a difference. As of mid-February, Southwest Airlines became the first U.S. airline to introduce an iPhone app last year, betting that an easy-to-use application could generate an untapped base of customers who might otherwise avoid surfing the Web on the phone. Southwest’s app was the most popular travel-booking download in the iTunes App Store, according to Michael Van Houweling, Southwest’s director of online marketing. In a survey of frequent business travelers conducted by PhoCusWright in 2008, 71% said they have used a smartphone for business during their trips. Such third-party applications remain the most popular services among travelers. But with smartphones representing a new sales channel, the travel industry is aggressively migrating to the mobile platform. Starwood’s Aloft Hotel in Lexington, Mass., is testing a keycard using radio frequency identification, or RFID, technology. The hotel has distributed RFID keycards to some loyalty program members, who receive text messages on the day of arrival that disclose the room number. Guests can go directly to the room and tap their assigned card through the sensor on the doorknob to unlock the door. GPS enabled mobile apps not only offer more convenience, they filter and focus targeted and relevant location aware promotions and ads. Mobile search ad spending in the U.S. is expected to grow to $531 million this year, up from $242 million in 2009. A recent study from the Gartner Group shows that 59 percent of United States banks will be ‘amping-up’ their mobile banking services in the next twenty-four months. Counting over 250 million U.S. mobile subscribers, statistics indicate that 50 million households currently bank online and the projections of “Online Banking Report” predicts 18 million more mobile banking users by 2011. The number of banks offering mobile services more than doubled in 2009 – According to a 2008 survey from Fiserv Electronic Banking Services 75 percent of respondents would use mobile banking services when offered. The ultimate in mobile proximity marketing converts cash on hand to cash in the hand of a subscriber shopping with friends and don’t forget to download those mobile coupons. 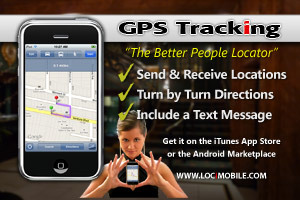 Find yourself, find your friends with the new GPS Tracking App by LOCiMOBILE.